Increases hair growth speed up to 121% and prolongs hair life. Are you looking for a boost to give life back to your tired, thinning hair? Through many years of intricate research, NUTRIGROW have developed a unique formula which is pure, complex and excellent at delivering effective results. If you are suffering from thinning hair and slow hair growth then you need to try NUTRIGROW. NUTRIGROW works on a cellular level making it the first anti hair loss product available which stimulates the Mitotic activity of hair bulb cells and boosts keratinocyte differentiation. This innovative Mitotic Effect directly affects and increases the production of cells responsible for the production of hair. 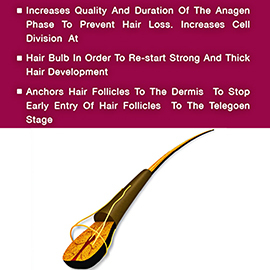 It results in dense, strong and faster hair growth and acts to effectively prevent any potential future hair loss. NUTRIGROW is a natural, herbal formula suitable for daily use and contains no substances which are foreign to your hair or scalp. The patented complex formula produces unprecedented protection against hair loss thanks to active NUTRIGROW agents. 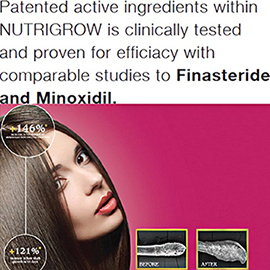 Why do you need NUTRIGROW Serum to help combat your hair loss? The triple-action formula produces three direct effects on hair growth, each contains specially formulated active ingredients which work to prevent hair loss, increase the amount of hair and make hair growth faster. ACTION 1 – Prevent hair loss: Restorative peptide complex reduces the activity of a 5 areductase type 1 & 2 and improves blood circulation. 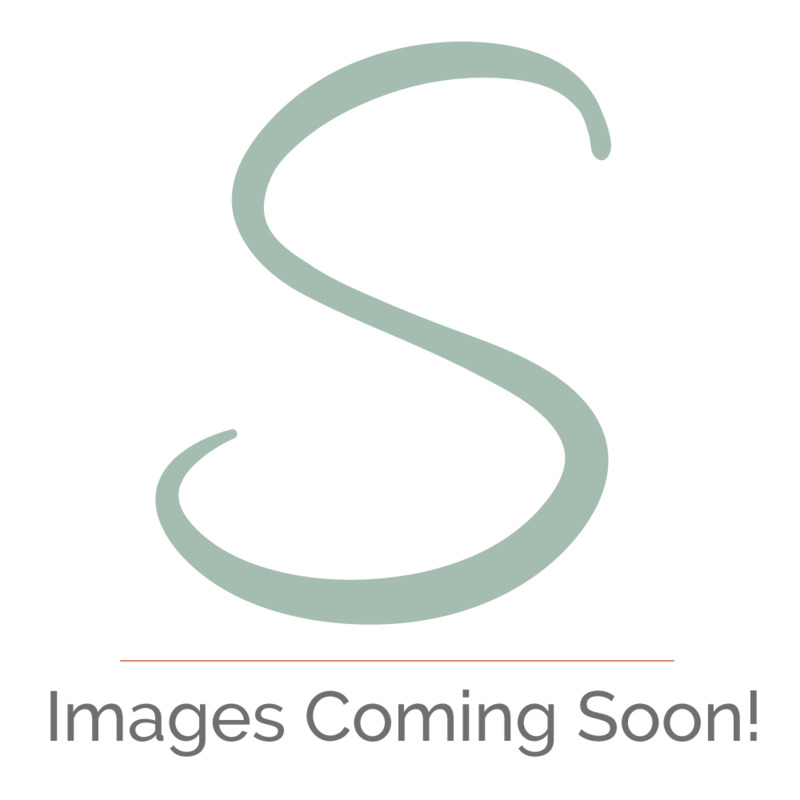 ACTION 2 – Stimulates cell proliferation for new hair growth: Vitamin essential complex directly increases the production of cells responsible for the production of new hair. ACTION 3 – Promotes faster hair growth and prolongs hair life: Mineral ferment complex provides a 121% increase in hair growth speed and enhances hair anchoring to prolong hair life. Each bottle contains a sufficient amount of serum for a 14 day application. However, for long hair, one bottle may be enough to apply over a period of 10 - 12 days. Start the application with the bottle labelled No.1 and follow the instructions. When you have finished the first bottle, continue the application with the bottles labelled No. 2 and then with No. 3. After this application, you will have completed the first 6 week treatment using NUTRIGROW serum. Ensure your scalp is moist and dry. Apply enough drops of the serum to nicely dampen the area of application where hair loss has occurred or where hair is thinning such as on the crown of the head or forehead or where you feel that your hair is thinning or receding. Apply your serum once or twice a day (in the morning and the evening). Gently massage the serum into the desired area on your head for 1-2 minutes paying close attention to the scalp so the serum thoroughly absorbs. There is no need to rinse your hair. If you have to wash your hair, wait at least 6 hours after applying the serum. NUTRIGROW has unique and patented material in order to return your hair to a healthy growth cycle. Don’t suffer from the confidence-damaging effects of hair loss any longer and take action today with the NUTRIGROW Serum – you won’t regret it. Aqua, Alcohol Denat., Butylene Glycol, Ppg-26-Buteth-26, Peg-40 Hydrogenated Castor Oil, Apigenin, Oleanolic Acid, Biotinoyl Tripeptide-1, Hexylene Glycol, Saccharum Officinarum Extract, Citrus Limon Fruit Extract, Pyrus Malus Fruit Extract, Camellia Sinensis Leaf Extract, Betaine, Hexapeptide-11, Saccharomyces/Magnesium Ferment, Saccharomyces/Iron Ferment, Saccharomyces/Copper Ferment, Saccharomyces/Silicon Ferment, Saccharomyces/Zinc Ferment, Allantoin, Phenoxyethanol, Ethylhexylglycerin, Xanthan Gum.